This time of year we birders are all about firsts. The slow return of breeding birds to the higher latitudes has every one of us eager to add new species nearly every week to our burgeoning year lists. We even have an acronym to describe the phenomenon. FOY, easily recognized by any listserv subscriber as First Of Year, the blessing and the bane of anyone who steps away from the computer to return to an inbox packed to bursting with Blue-gray Gnatcatchers and Eastern Phoebes and Ruby-throated Hummingbirds. We track these arrival dates as fastidiously as a sabermatrician tracks Roy Halladay’s pitch counts, comparing them to years prior in our own sort of personal and amateur phenology. And why not? It’s exciting. One day the birds are not here, and the next they are. Ecology made simple. But it’s easy to forget in all the activity of new arrivals that departures are occurring too. This is a less precise sort of thing, as birds never pack up and leave like a ghost in the night all at once. There numbers ebb, as the winter residents move on to be replaced by winter residents from parts south and so forth and so on until one day you’re out in the field and you think to yourself that you haven’t seen a Dark-eyed Junco in something like three weeks where they’re used to be great flocks of them working the margins of every field in the area. Maybe that makes me a blundering birder to miss missing them one day. I generally go through my daily routine with an eye towards what’s around me, but when one species slowly winks out it’s easy to ignore. One week I notice a few junco songs when I didn’t hear them all winter, and the next, I’m wondering to where they all departed There was no single moment to see them off. There was no last junco. 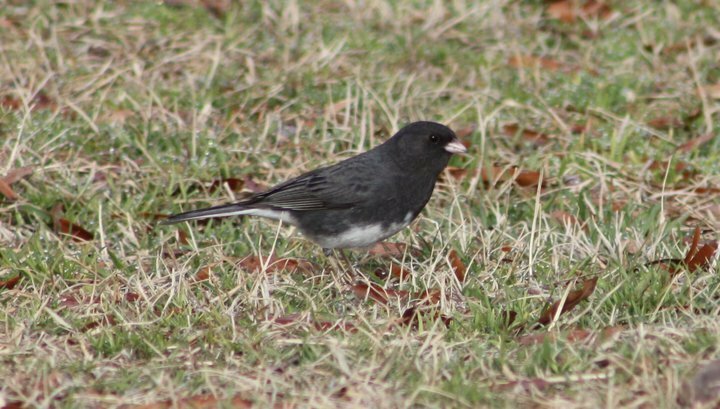 I was thinking about this just this past weekend while I was in the field and ran into a small flock of a half dozen juncos working their way along a forested hill near a creek in Wake County. They were the first juncos I’d seen in some time, and that realization surprised me. Perhaps these, mostly female, clearly associating, birds would be my last juncos of the year. The odds were good, aside from the populations that nest along the high ridges of the Appalachians, most juncos have split by the end of March. Other wintering sparrows, the Foxes, the singing White-throateds, linger until the last wave of real neotropic migrants push through, but the juncos – or at least the absence of the juncos – as a true a sign of the changing of the seasons down here as any spring arrival. It’s just nearly impossible to pinpoint the exact time they’re gone. Of course, if I manage to come across any more juncos before the end of April, those will have to supplant these as the true last birds. And after that? I suppose I could pick some up in April, though they’re thin on the ground by then. When it happens, it almost certainly won’t be anything I realize until way after the fact. Until they come back in the fall, of course. I’ve got very precise notes for that return. Boy, my sentiments exactly. Just moments ago I was watching the trio of White-throats who’ve rummaged my patio this winter and found myself wondering how much longer they’d be around. This invariably leads to thoughts of Juncos. Have I already seen the last of them and not noticed? They always seem to slink out of town. It is now December 5th and we have not seen a single junco. The weather has been unseasonably warm–does that mean that the juncos are telling us something—there may not be a winter this year? We really miss them.